Turner Classic Movies has released their July schedule online, and the July Star of the Month is...Gregory Peck. 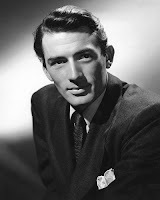 TCM will be showing over 20 of Peck's films on Monday evenings in July. Other films airing in July I'm especially interested in: BUT THE FLESH IS WEAK (1932) airs on July 21st; it's the original Robert Montgomery version of FREE AND EASY (1941), which I reviewed earlier this month...SUCCESS AT ANY PRICE (1934) with Douglas Fairbanks Jr. on July 2nd...THE TRUTH ABOUT YOUTH (1930) with Loretta Young on July 20th...and ABOVE SUSPICION (1943) with Fred MacMurray and Joan Crawford on July 26th. I'll be taking a closer look at July on TCM this summer! Other Stars of the Month coming soon: Donna Reed in May and Natalie Wood in June. I never heard of "But the Flesh is Weak"; the title alone is intriguing. Can't wait for Donna Reed next month. She is one of my favorites but I felt she never got the full attention she deserved.